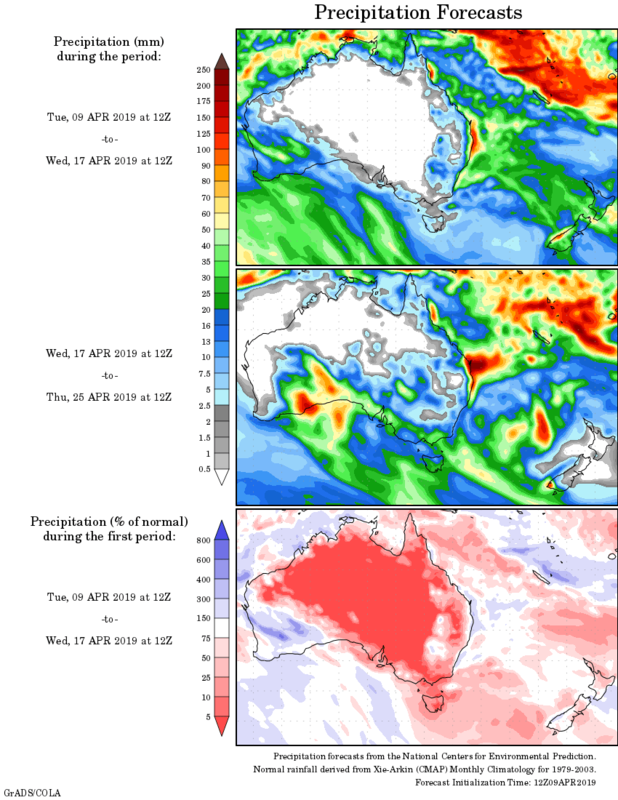 A MONSOON trough and embedded tropical systems produced moderate falls across northern tropical Australia, while a series of cold fronts tracked across southern Australia, generating moderate falls in Tasmania. Past seven days: In the north, the monsoon trough and embedded tropical systems triggered showers and thunderstorms, and brought light falls to the Top End in the Northern Territory, the Cape York Peninsula and north-east tropical coast of Queensland at the start of the week. These strengthened to moderate falls and continued over the remainder of the week, extending into the northern Kimberley in Western Australia from mid-week. At the start of the week, a cold front and surface trough, in combination with an upper level disturbance to the west, generated a cloud band over southern Western Australia. Light to moderate falls were recorded over parts of the South West Land Division, extending into the south of the Goldfields District. Onshore south-easterly flow produced showers with light to moderate falls in south-east Queensland and along the northern half of coastal New South Wales. As a surface trough tracked eastwards from inland to eastern New South Wales, showers produced light to moderate falls over the southern half of the coast in that State. A cloud band, with isolated thunderstorms associated with a cold front, tracked across the Tasman Sea during the middle of the week, bringing moderate falls to western and northern Tasmania. A second cold front swept across south-east Australia at the end of the week, producing further moderate falls in western Tasmania. Widespread light falls were recorded over much of the southern half of Victoria and south-eastern South Australia in the last day of the week. 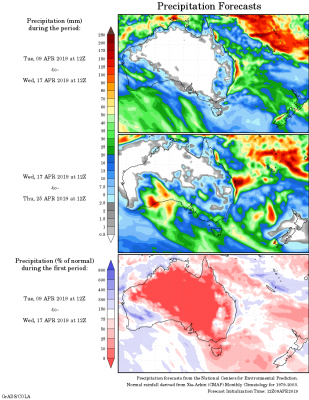 A tropical low embedded on the monsoon trough to the north of the Kimberley intensified into tropical cyclone Wallace, although the system had little impact on the mainland, and remained well off the north-west coast of Australia. Rainfall totals in excess of 200 mm were recorded in small areas of the coastal Top End in the Northern Territory, far northern Cape York Peninsula and north tropical Queensland coast. The highest weekly total was 418 mm at Alcan Minesite in Arnhem Land in the Northern Territory. Rainfall totals in excess of 100 mm were recorded in the much of Arnhem Land and areas around the coast of the Darwin–Daly District in the Northern Territory, the northern half of the Cape York Peninsula and along the coast from around Cooktown to Cairns in northern Queensland. Rainfall totals in excess of 50 mm were recorded in much of the Top End, the Cape York Peninsula and north tropical Queensland coast, and western Tasmania. Rainfall totals between 10 mm and 50 mm were recorded the northern Kimberley and parts of the South West Land Division in Western Australia, extending into parts of the southern Goldfields District; remaining areas of the Top End and Gulf coast in the Northern Territory; far northern Queensland and along the east coasts of Queensland and New South Wales; southern and far eastern Victoria, and most of Tasmania. Little or no rainfall was recorded in remaining parts of Western Australia; the Northern Territory south of the Top End; most of South Australia; most of Queensland away from the east coast and far north; much of New South Wales except the State’s east coast; north-west and central northern Victoria, and most of South Australia apart from the south-east.